Completely renewed in its graphics and climbing photos it presents many new features: fantastic valleys which are worth the trip no matter where you are setting off from, legendary routes which have made the history of ice climbing and other less popular ones, but of great character. 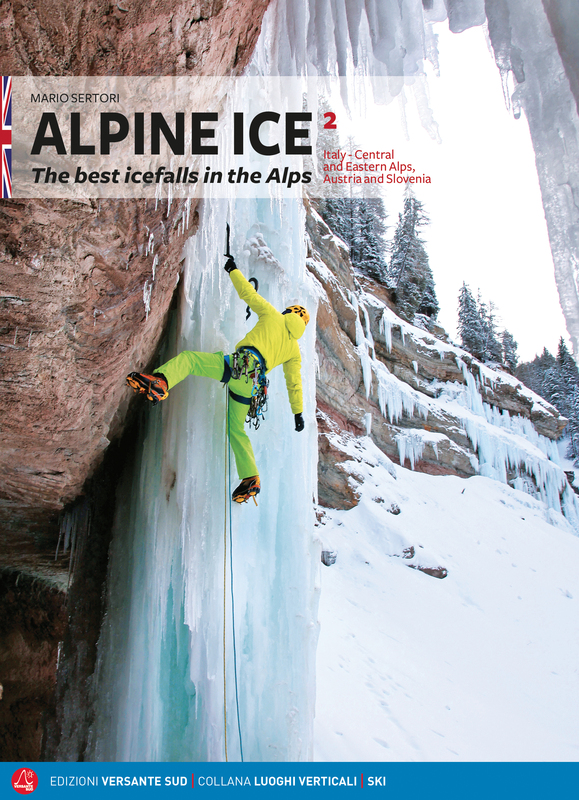 The amount of ice falls described has more than doubled compared to the old guide book which was already substantial. It thus became necessary to divide it into two different volumes: Alpine Ice vol.1 France, Switzerland and Italy – western Alps and Alpine Ice vol. 2 Italy – Central and Eastern Alps, Austria and Slovenia. There are approximately 650 climbs described in this second volume, and just like the first guide book we have made it easier for those who have difficulty in finding their way, by including photos of every ice fall, the geographical coordinates of car parks and of almost all the routes. Increasingly precise information which must not take away the sense of unknown which remains when tackling an ice fall, but should be analysed and stored to reduce the risks. The work is completed with a few stories of ascents and a memoir on Luca Vuerich the very strong alpinist from Friuli who died in 2010. In a few words, a treasure chest of seducing proposals for adventurous climbers, an invitation to travel beyond one’s usual destinations, and an ode to the wilder side of the Alps. Mario Sertori, born in the Valtellina mountains, in the centre of the Alps, has been a Mountain Guide for a long time and is a passionate ice climber. He has climbed them everywhere, in Iceland, Norway, Scotland, Canada, USA, in the Apennines and the Pyrenees. In the Alps he took part in the exploratory phase discovering a few hundred new icefalls. He has written a lot about his adventures on the main European magazines and published in 2004, by Blu Edizioni, Cascate, Lombardia e Svizzera; for Versante Sud in 2007 Solo Granito(with Guido Lisignoli), in 2009, Alpine Ice, in 2012Ghiaccio Svizzero, in 2014 Val di Mello and the new edition in two volumes of Solo Granito.